Huawei introduced the new Huawei GX8 during the fall of 2015. This 5.5-inch smartphone belongs to the new range that could be considered ‘high-midrange’, as we consider the Moto X Play to be. Have these smartphones chiseled out a new class, or are they midrangers disguised as something else? Let's look at how it stacks up in this Huawei GX8 review. The Huawei GX8 went on sale in autumn 2015. Although not on sale at Huawei’s official store, you can buy it elsewhere. It is available in 32GB version with 3GB of RAM, microSD slot and three colors: champagne, silver and metal (black). We tested the silver version, which is white on front. It starts at US$350. The Huawei GX8 follows the design trends known of Huawei and Honor. Its appearance is like that of any high-end metal smartphone. It is wrapped in aluminum with two plastic strips on the back, top and bottom, to prevent the metal interfering with reception. The phone is somewhat heavier at 167g. Even like a little brick. To give an idea, it weighs 14g more than a Galaxy S6 Edge+, which has a screen of 5.7 inches. On front is the 5.5-inch screen covered by curved Gorilla Glass 4, with 2.5D on the edges, and some not very nice black bezels, hurting the phone’s screen-to-body ratio. On front you’ll also find the logo of Huawei and a speaker for calls, front camera, proximity sensor and LED notification light. There is also a pattern of dots under the glass, thanks to the white face. On his side are power and volume buttons in various metallic finishes. The home button is rougher. This texture wasn’t so easy to notice on my fingertips, but perhaps that’s due to the cold weather in Berlin. At the top are the headphone jack and noise-canceling microphone for calls. At the bottom are speaker grilles, but sound only comes out of one. At the back is the camera, dual LED flash and fingerprint sensor, plus the plastic bands I mentioned earlier. The GX8 is an elegant, sober smartphone, but something large and heavy. For those who want a large screen and not spend a fortune on something with premium appearance, clearly it is, next to Honor 7 among the very best. The Huawei GX8 packs a 5.5-inch LCD panel in Full HD (1920 x 1080 pixels) resolution, which gives a pixel density of 401 ppi. It's a brilliant screen - it’s impossible to see individual pixels - and with good viewing angles as well. But there are two details that do not convince me: first, the reflections that occur because of 2.5D glass. Another detail that I do not like is the black frame around the outside of the display. This changes the body/screen ratio to 71.7 percent (an LG G3, for example, has a ratio 76 percent). The display of the Huawei GX8 is great but could have been better for the price, and perhaps 2.5D is not everything, even though Huawei seems somewhat obsessed with it lately. The Huawei GX8 is full of secrets, many of which already exist in other Huawei devices. The fingerprint scanner of the Huawei GX8 is very easy to set up. I find only one downside; it looks quite large on the back of this phone. This again is a matter of taste, but it’s a tricky one for me even though I have somewhat large hands. The scanner also has other functions. It serves as a touch button for various functions such as answer calls, take pictures or video, stop alarm or display the notification panel. The Huawei GX8 has a mode for one-handed use. This mode creates a smaller window in either of the two lower corners so you don’t need to reach as far. Another option that Huawei has added is gesture control. With it, you can draw different patterns on the screen that serve as shortcuts to open an application or access the camera without having to unlock the screen. The can be predefined, or you can set it yourself. There are dozens of options on the Huawei GX8, but I did not want to stretch this section. Almost everything you look for can be found in this phone. Even more than you need. The GX8 brings EMUI 3.1, a Huawei layer over Android 5.1 Lollipop. As with all Chinese phones, there is no app drawer. We also see some changes with, for example, a multitasking square having to slide up or down to close apps. I personally prefer the style of stock Lollipop. The Huawei GX8 will soon enough get an update to Android Marshmallow. As for pre-installed apps, there are a total of 28. Of the 28, I consider about 15 useful and essential. Don’t bother with the rest, but if so, most can be uninstalled by simply dragging them to the top of the screen. Furthermore, only 22GB of the phone’s 32GB are free out-of-the-box. Its memory can be expanded via microSD up to 128GB. The GX8 makes use of an octa-core Qualcomm Snapdragon 616 processor with a maximum speed of 1.5 GHz for four of its cores and 1.2 GHz for the others. In addition, it houses an Adreno 405 GPU and is backed by 3 GB of RAM. The Huawei GX8 has been subject to the torture of all our benchmarks and has managed to place itself at a similar level to the new Galaxy A3 and A9. Its performance does stand at around 20 percent higher than the Moto X Play, however, no doubt aided by the extra gigabyte of RAM. In real world use, as we sometimes get tired of saying, the GX8 Huawei handles both complicated and simple tasks well. There haven’t been any crashes to report, though there has been some lag when multitasking, particularly when going from a game to another app. But it’s not a serious delay, and it processes even demanding games without major problems. Despite how it looks, the GX8 does not house a pair of speakers: only the right side provides audio. This mono speaker pumps out sound at a suitable volume, with a clean and crisp tone, and little noise. If it needs to be said, the GX8 is not on par with devices with stereo speakers, however. While the speaker is sufficient, there are also some headphones provided in the box. These add handsfree functionality to the device, but the sound quality leaves much to be desired: it’s the worst I can remember hearing in a pair of headphones. So we arrive that the Huawei GX8’s best feature: the camera. Housing a 13 MP rear camera with autofocus, and a 5 MP snapper at the front, the results of the sensor are generally very good with minimal performance decrease in low light. The colors are balanced and the HDR mode adds an excellent luminosity. The GX8 even houses a dual-LED flash - a feature not found in most smartphones in this range - to help support even more natural colors. The automatic focus is fast, as is the selective focusing speed, and it includes manual and automatic modes. Huawei’s camera interface and software make the GX8 a pleasure to take pictures with. The 5 MP front camera offers a number of different, very Asian, beauty and selfie tweaks (which are quite complicated to understand); it even includes makeup software. In this photo you can see pink lips and eyelashes added by the GX8. It can be quite funny, but not all of these modes will be of use to you. All in all, I have to say though that the camera GX8 is one of the best in its medium / high range class. 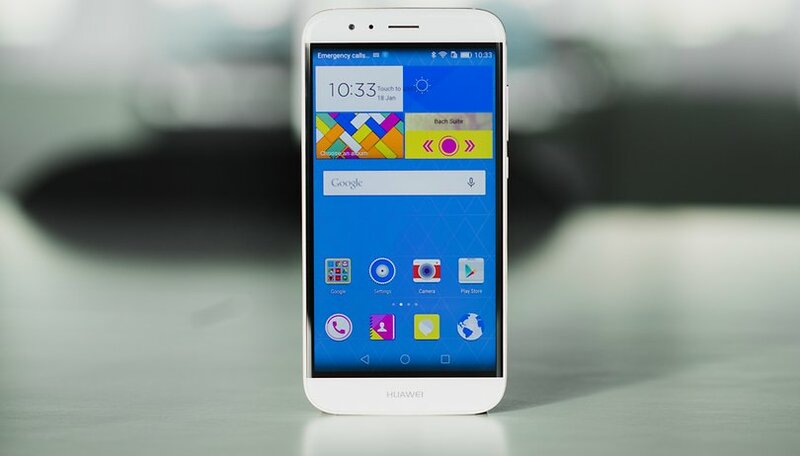 The GX8 Huawei places a 3000-mAh battery behind its 5.5-inch Full HD screen. It is not the best we've seen, but you can squeeze a day and a half out of it under normal use (WhatsApp, emails, reading the news, etc.). In our AnTuTu battery test, the GX8 scored 5518 points, on par with the Meizu Metal, Galaxy S4 and Xperia Z5 Premium: devices that aren’t renowned for their great battery life. The Snapdragon 615 processor features a fast charge function, but, sadly, this has not been taken advantage of on the GX8. In fact, one of the things that I do not like about the GX8 is how long it takes to charge. The charger that the device comes packaged with transmits 1A and takes about 2 hours to fully charge the GX8. Luckily, I wasn’t in any rush at the time. The Huawei GX8 includes various energy-saving modes to help you optimize the device’s consumption. The Huawei GX8 leaves me with mixed emotions. On the one hand, its design surprises with its premium appearance and solid build quality, but this doesn’t contrast well with the handset’s poorly integrated screen. Hardware-wise, the GX8 is more than capable of catering to the average user’s daily needs, with 3GB of RAM kicking about under the hood, and the camera produces great results. The GX8 does, however, lack some personality. Perhaps the similarity in appearance shared among the whole Huawei 2015/2016 family means new devices simply don’t provide enough surprises. For someone who doesn’t spend their days playing with Huawei’s, however, you will find a mature, nice and solid device, which you can rely on to get you through the day. I installed Cyanogenmod 13 on it. NOTE! If you don't know what a ROM is or what TWRP is, don't even attempt, it could ruin it. But being able to run the same stock Android Marsh mellow is amazing, it adds so many features and runs more stable and smoother. would you share with me the rom link please and also does the fingerprint sensor works with ur rom ? The //Huawei GX8 software// part is repeated twice! And also in the part where the //In this photo you can see pink lips and eyelashes added by the GX8. // is there, the relevant picture is not visible! I got a G8 last november when my phone died in Malaysia. I was impressed. But I also noticed that it was somewhat laggy when opening apps. That was the moment when I first realised that even though this phone is beautifully built it is not a flagship model. I have the 2.5 D glass on my Moto X Pure. Visually and tactilely , it's a nice touch. But it's a negative in actual use. The glare you mention, the hassle of screen protectors, a bulkier case is needed for protection. Added cost to make. It's another time when the designers have let looks get in the way of use and purpose.